To perform at your best in each hunting season, success often depends on how far your feet can carry you. Without right hunting boot, your feet may become too sore, cold, overheated or sweaty that your chance of returning home with more than an empty Thermos. 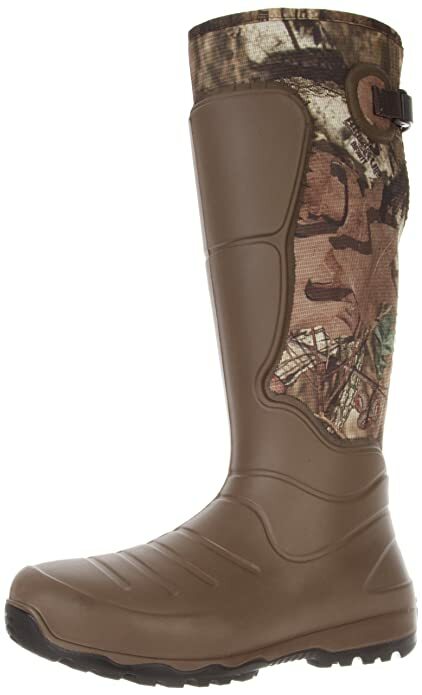 LaCross Men’s Aerohead Hunting Boot is a revolutionary knee high hunting boot. It features AeroForm technology allowed to mold a liquid polyurethane layer or glove-type form or shell over a neoprene sock. This groundbreaking technology offers a thick layer of cushion underfoot, a ground-grabbing rubber outsole and an integrated shank for the support that redefines comfort and protection. Thus, it ensures an extremely comfortable fit with ultimate flexibility and durability in a lightweight form. This LaCross Men’s Aerohead boot is not only suitable for hunting but also for hiking and scouting. AeroHead insulated boots are handcrafted with the ideal balance of flexibility, weight, and durability for hunting. They are waterproof and scent proof boots that made of liquid polyurethane over 3.5 mm neoprene for lightweight and insulated protection which fits like a glove. Its brush tuff technology provides an outstanding abrasion resistance against brush and rocks. The rubber outsoles prevent dirt buildup which causes loss of traction. A soft 100% polyester wicking liner keeps the feet dry and comfortable during extended wear. This insulated boots also have adjustable back gussets that comes with a strap for custom fit. The injected PU midsole and integrated shank provide proper comfort and stability. Its average height is 17 inches and average weight per pair is 5 lbs. AeroHead is a unique boot among the other hunting boots available in the market. It is apart from other camping boots just because of its comfort. It is the most comfortable knee high hunting boot that you ever found. This boot fits comfortably through its neoprene and you get the support and toughness of the rubber. LaCross Men’s boot is the lightest knee high hunting boots which are comfortable and close fit around the foot and ankle. It makes you feel like ankle has more support and does not rub much more near the heel. It is effortless to take these hunting boots on and off. Along with comfort, a quality hunting boot keeps your feet warm and dry. LaCross Men’s hunting boot hits the nails on the head for all of these criteria such as This waterproof boot keeps you dry whatever you have crossed like puddles, creeks, rivers, and swamps. This boot also keeps you on your feet. Its fitting nature provides high ankle support which is essential for your ankle sprains. These boots give you an excellent tread which allows you to go up and down the ridges and ravines safely. Non-loading rubber outsoles prevent dirt buildup. AeroFrom technology for insulation and flexibility. A leak can be developed after some sessions due to the nasty terrain. In short, LaCrosse Men’s AeroHead hunting boots is truly different from others. If you think that hunting boots are just camping boots which have nothing special as long as they get the job, then you are wrong. We hope, this boots will change your hunting boots experience to a great extent after using it. So, this aero head hunting boot is our recommendation if you want to buy a new one. You need to try these yourself to have an amazing experience.